Are D&G moving to new premises in Northwich? The only facility in the current yard is a portacabin for the drivers to sign on and off. (08/02/2019 19:45)knutstransport Wrote: They are also advertising for PSV engineers to be based in Northwich, so presumably it will become a proper depot rather than an outstation of Crewe. (08/02/2019 21:22)iMarkeh Wrote: I'm glad they have confirmed that. It isn't normally the case though as far as I am aware. I was very surprised to see the Wales page and it to have the translation. Perhaps their website means it is easy to add new pages and routes etc. D&G bus have always respected the Welsh language, even more than some of the Welsh operators from Welsh Speaking Areas in North West Wales. (08/02/2019 23:24)Nwales Bus Wrote: D&G bus have always respected the Welsh language, even more than some of the Welsh operators from Welsh Speaking Areas in North West Wales. It is interesting though isn't it as they are based so far away, you just wouldn't expect it given the way companies are these days. Look at Stagecoach, they run the 5 (Mold and Wrexham), 16 (Saltney) and the 63 in Wales and they don't have any translation available anywhere. I know it is a big generalisation but still, it just didn't seem like the sort of thing for D&G to do. I seem to slightly remember the 89 having the Wrecsam destination. I didn't see it on the return journey I will admit but it is good to see them doing bi-lingual dests given even some welsh operators don't do bi-lingual destinations haha. I think the website was built with the intention that things could easily be changed. At one point there was a Services in Shropshire page and the Services in Greater Manchester page only appeared when they got the 88 contract, despite at the time their only GM service being a Cheshire route which ran beyond the GM boundary. If you recall the SLT website was built from exactly the same template as the D&G website. I never really understood the practice of putting English towns and cities in Welsh on destination displays, whether it's train or bus. TfW Rail translate Manchester - would any Welsh speaker really struggle if Manchester wasn't displayed in Welsh? I imagine very few Nantwich residents know what the Welsh translation of their town is so would have to wait for the English to reappear. Destinations alternating between two languages (as opposed to showing both simultaneously) could very well be in breach of the PSVAR which requires the final destination to be shown at all times. Is this in competition with any other operator? 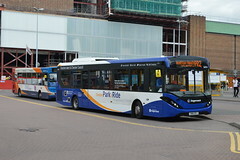 (15/02/2019 07:14)childwallblues Wrote: Is this in competition with any other operator? It's a contracted service. Already discussed in earlier posts.